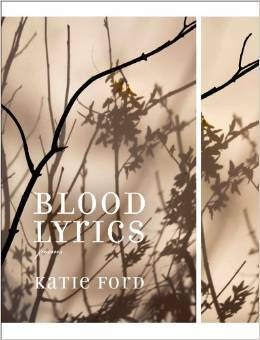 In her third volume of poetry, Blood Lyrics: Poems (811 Ford) from Graywolf Press, Katie Ford accomplishes something remarkable. She succeeds in telling a rough story, housing her poems within a sweeping arc across the length of the book, without ever allowing her lyrics to be lost within that arc, reduced to mere pieces that lose their beauty outside of the whole. These pieces stand alone as fine poems, but lodged within the loose-but-sure structure of the broader work, they comprise a grander plea, a bitter prayer, something of a treatise. Like the Psalmists, Ford has found, and expresses, that beauty and despair often walk hand in hand. Blood Lyrics takes as its seed the premature birth of Ford’s daughter with writer Josh Emmons. The child’s life was in jeopardy for some time after the birth, and the early poems focus on this period of intense emotion. Ford bleeds out on the page, wrenching her heart dry with fear and anger and uncertainty. The book opens with the poem A Spell, in which she offers up every good thing in her life to whatever sadistic Other is holding her child ransom. Ford’s lyricism itself merits a mention. There is no sense here of a poet either trying too hard or needlessly obscuring her language. These poems, while not easy or transparent, read smoothly and flow off the tongue and into the ear with a gentleness that belies the harshness of their subjects. It would be a delight to hear these poems read aloud by their author, though no doubt the heaviness of their emotion would be even higher and harder with that reading. I have stated that the book deals plainly with Ford’s emotion in response to her daughter’s peril, but the settings of her language are in fact quite physical. She places us in the children’s hospital, makes us sit in clean waiting rooms, tells of receiving details of dosages, has us take down a whiskey bottle one night, stretches us on more than one gurney. So visceral are the materials of her writing that at times it edges into body horror. She forces us to look past the balloons and teddy bears to experience the sickly pallor of a children’s ward; she makes us feel the primal fear and disgust of the human, mammalian body betraying its owner. Opposite a poem titled Children’s Hospital sit orphaned lines (page 11) telling us her joy has evaporated, concluded by an explanation of sorts – so I sing of hell / and the brutal body. Around the halfway point of the book, Ford steps back from the terrifying specificity of her situation and begins to reflect on broader human suffering. These poems unflinchingly rebuke the warmongering of nations, of our nation. One poem is comprised entirely of the names given to drones and missiles – Savage, Sinner, Scapegoat, Peacekeeper, etcetera (page 45). Rather than losing her voice in this broader highmindedness, Ford maintains the beauty and savagery of her language while also keeping hold of the first section’s guttural emotion. This is neither self-righteous posturing nor revolutionary idealism; it is the clear-eyed observation of a wounded mother, bitter and exhausted and scraped too thin to care about the rightness of any given politic: every death is a child’s death, every grief a mother’s grief. We can’t do this anymore. But you go and name your missiles. Throughout the book, both in the first half dealing with her child’s precarious health and in the latter half dealing with humanity’s brutality to itself, Ford peppers in questions of theodicy. Early on this is personal, Jobian, and later scales out to take in what has become of humanity at the hands of whatever god, or ghost of one, is overseeing us. less weary in love than he. and will not gleam while villagers drink the ditch. Perhaps this reviewer’s favorite individual piece from the book is the poem Choir (page 54), which I won’t reproduce in its entirety here. It stands out from the book by only tangentially, in the final lines, touching on the themes described above. It speaks of the delight it was to once know certainty; whatever faith the poet once held is watery and no longer of aid. The regret, however, is only for the feeling of the comfort; the cost of it was too high. She concludes: we would have despised anyone / to keep our song. Blood Lyrics is available now at Greenville Public Library.